Do you remember the children’s game duck, duck, goose? A group of players would sit in a circle, facing inward and one would be it and walk around the outside of the circle tapping each child on the shoulder, “duck, duck, duck.” And then they’d finally pick one to be the “goose.” Frantic chasing around the circle ensued — until one tagged the other. I don’t remember the details, but the name came to mind when I sat down to write this post. I think “duck, duck, goose” morphed into “spin the bottle” once adolescent hormones kicked in. Not that I would know. Eggs — duck, duck, goose. The notes attached to the eggs in the photo above have nothing to do with who laid them. I have a winter egg share from my local CSA, Grant Family Farms and I’m now receiving some duck and goose eggs to go with the chicken share. My name is simply on my eggs at the pick-up location so share-holders don’t get confused, so no snide comments please. 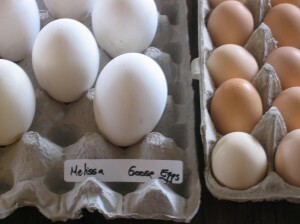 The photo is of one goose, duck, and chicken egg so you can see size comparisons. The ducks, geese, and chickens at Grant Family Farms are fully pastured and consume an organic diet. The egg’s nutrition and flavor depends on what the birds eat and these lucky ducks (et al) eat what they’re supposed to be eating — bugs, plants, grasses and organic veggies. I’m told they’re particularly fond of organic romaine lettuce and have a rowdy barn dance when that’s served up. I suppose that’s one of the perks of living at Grant Farms Bird Spa. They have their own half-acre and access to swimming, fresh air, sunshine, and great food. In the case of Grant Farms, “organic and pastured” means the birds live the good life outside, eat organic food, and are treated with care and consideration (as they should be). “Free range” may mean the birds are packed into a warehouse, but uncaged. It’s not quite what the name implies and the birds and the nutritional value of their products may be compromised. I’m finding it more and more important to know where my food comes from and who is responsible for growing, raising, and caring for it. The ducks at Grant Farms are of the Peking variety and the eggs are cream-colored and make for light and fluffy baked goods. If you bake with gluten-free flours, these eggs help add texture and “spring” to everything from pancakes to muffins. 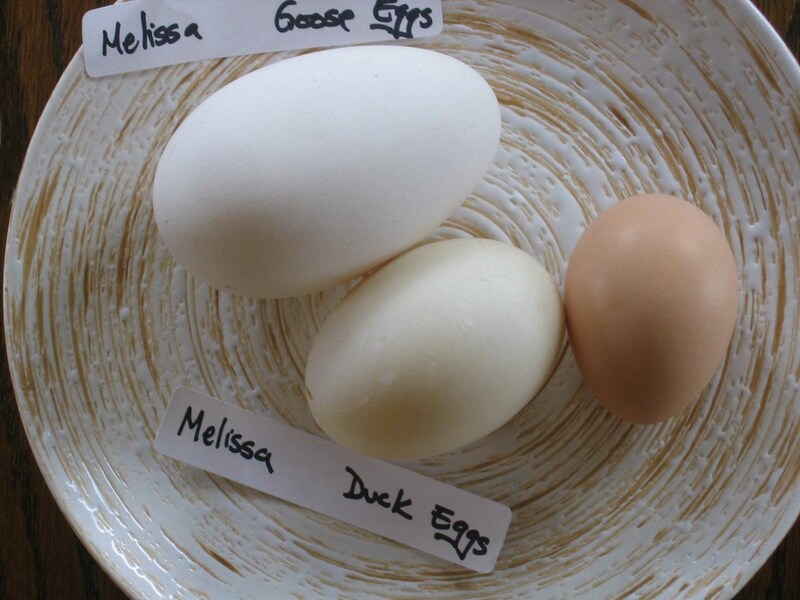 The goose eggs I receive are from any of three breeds — Toulouse, African, or White Chinese and they’re big, as you can see below (compared to chicken eggs). One duck egg equals about 1.5 chicken eggs and 1 goose egg makes for 2 chicken eggs. They seem creamier than chicken eggs and the whites beat up a little stiffer. I LOVE them for gluten-free baking. For everything you ever wanted to know about the nutrition of chicken eggs, including why you shouldn’t worry about them in connection with your cholesterol, check out this past post I did on the subject. If you eat eggs, choose high-end, pastured chicken eggs. This entry was posted on Wednesday, February 18th, 2009 at 3:00 pm	and is filed under Celiac & Gluten Intolerance, Gluten-Free Recipes, Miscellaneous, Nutrition Therapy. You can follow any responses to this entry through the RSS 2.0 feed. You can leave a response, or trackback from your own site. That and the previous post were very informative. I have seen Duck- and Goose eggs, but never bought any. I am off to China on Tuesday, maybe I will try some there. I always see some running around, but not so sure how “organic” any food in China really is. Welcome and thanks for the comments. I’m really liking these eggs for baking. I think maybe the duck eggs are my favorite, although I’m not sure yet. Well cared for fowl living outdoors and receiving a good diet have to be the way to go…. not only from an animal welfare point of view but taste and quality of eggs. Another great idea is to extract the whites and yolks then paint or decorate the shells for Easter. An excellent post Melissa and something everyone should be made aware of. Sadly the majority of the British public seem quite willing to pay very little for a chicken which has lived it’s short life inside, with no room to move about, poor diet and miserable existence. There are some prominent people currently trying to change this but it’s going to be tough in the economic climate. Not only that but as I was eating my Japanese egg noodles the other day, it occurred to me that the egg content was unlikely to be free range…. it’s a global dilemma. Thanks for your comment, Cid (thoughtful as always). It is a global dilemma. You are so right! I advocate eating local, eating organic, caring about where our food comes from and so on. But my favorite organic coffee is from Central America and East Africa, my favorite cinnamon from Saigon, my vanilla from the West Indies, so it is a dilemma. But we also need to enjoy life while becoming more aware of the impact of our choices. It’s difficult enough ‘policing’ the standards in the UK, not every farmer is an honest John …. but abroad who knows what’s going on with agriculture and livestock. Presumably the goods you and I buy are randomly checked when they enter the country? Like you I’m picky about how my food is grown etc and I’ll cheer out loud when the world does away with mass produced, intensively bred chicken farms for one thing. Countries need to trade, people need to eat and the methods we’re discussing here are more expensive to produce so the consumer must get used to that and then make economies else where. Good point about organic coffee…. I’ve found it difficult to get the actual beans although organic ground coffee is freely available. Tea is a different matter, I love it so every now and then I go to my favourite shop 30 miles away and stock up. Perhaps I’ll have to look for organic coffee beans online. I like the sound of Grant Family Farms and am about to take a closer look. I can’t wait to have my own chickens! I think I’ll plant some extra romaine, just for them. I’ve heard of a high protein millet that they also love. Looking for a seed source. A friend has shared her duck eggs with me, but I never tried them in baked goods. Hmmmm. I love the idea of the egg sharing scheme. I must admit I’ve not heard of anything similar here. In the UK we have an egg sharing scheme here but it has more to do with women donating ova for free IVF treatment. Very good point about the loose use of the term ‘free range.’ On closer inspection our regulations in EU-land also have the marketting terms ‘free range traditional’ and ‘free range – total freedom’ (the latter I’ve never seen in any shops) all relating to the birds’ access to the outdoors and the number of birds kept within a certain area. Considering these are marketting terms, ie. terms presented to we the public, how on earth are we supposed to cut through such confusion and make an informed choice without ploughing through statistics on a government website?? Hey, I’ve just had a Melissa-style rant! Your blog is clearly having an affect. Wish we could just sit and blah, blah, blah about all this over some of that tea worth driving 30 miles for. And what is your tea of choice? I love that — a squabbling good story! Pigeon eggs don’t sound all that inviting, do they? I’m loving duck eggs for gluten-free baking. It does seem to add some “spring” and texture to the end result. Try it and let me know what you think. Boy, you are turning into a total farm girl, aren’t you? The CSA and “sharing” idea is a wonderful one. You can even buy a share in a dairy cow so you can enjoy raw milk (it’s illegal unless you “own” the cow). Hey, do I rant? Nooo. Really? Okay, fine — I rant. Actually, you have no idea. My tea of choice this month is organic Keemun Spring Gold, which is a black China tea. Some time back I had a lovely batch of Royal Phoenix Feathers which was similar and one of the most delicious I’ve tried. I always keep a good Breakfast Blend Assam in because no one else seems to like the China. A South African Redbush, several Earl Grey’s and box of herbal and green teas. Please don’t think the rest of the UK follows suit…. you’re much more likely to find a box of standard tea bags in the average household along with some instant coffee. Funny how I know nothing about you other than brief blog comments, but somehow we are destined to be friends. In fact, at first I thought you were a “boy” Cid rather than a “girl” Cid. But, every time you comment either here on on Miles’ blog, I always smile. We seem to have some commonalities (odd ones, I’ll admit). While I don’t use cups and saucers, I dislike having matching mugs or even matching wine glasses. When I have a dinner party, none of my wine glasses match and that’s by design. The fact that you are “drawn to an odd mix of cups and saucers” makes me smile. Who does stuff that? Me, that’s who. I can’t recall if I’ve tried goose eggs ever. I did bake with duck eggs many years ago. I believe they were duck eggs … hmmm, maybe they were goose eggs. Anyway, it was a long time ago, back in my gluten days and I thought the taste was different. The ducks or geese were in a home environment so more than free range, but I can’t remember all the details. I’ll try these again at my next opportunity. I’ve also read that people who can’t tolerate chicken eggs can often do fine with duck and goose eggs. That could make life a lot easier for many.